We’ve had a quick look at the origins of Covent Garden before (as part of our What’s in a name? series) but it’s worth a recap. Now a favorite of tourists visiting London, Covent Garden is these days largely known as a specialty shopping and entertainment precinct in the West End. But its beginnings as a market go back at least to the 1600s when a licence was formally granted to hold a market in the piazza. The land had been formerly owned by the Abbey (or Convent) of St Peter in Westminster which had established 40 acre kitchen garden here (hence ‘Convent Garden’) and had passed into the hands of the Crown at the Dissolution. Later owned by the Earls of Bedford, it was the 4th earl, Francis Russell, who commissioned Inigo Jones to design a great residential square- including St Paul’s Church, known as the Actor’s Church – on the site. By 1650, fruit and vegetable markets were regularly been held on the site and, interestingly, around this time the market adopted the pineapple, a symbol of wealth, as its emblem (it was also around this time that Punch and Judy shows were introduced to the area (see our earlier post on Mr Punch here)). 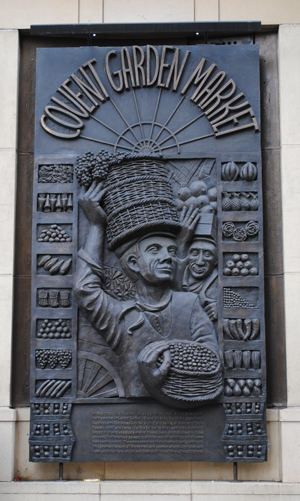 Covent Garden’s rise to prominence as a market came when the Great Fire of London destroyed many of London’s other markets leaving it as the foremost fruit, vegetable and flower market. In May 1670, the 5th Earl of Bedford, William Russell (later 1st Duke of Bedford), obtained the formal right to hold a market on the site from King Charles II. The growth of the market and the development of fashionable residential developments further west in Soho and Mayfair saw many of the affluent people who had lived around the market move out and the character of the square changed (in an indication of this, a list of Covent Garden prostitutes was published in 1740). In 1813, the 6th Duke of Bedford, John Russell, secured an Act of Parliament regulating the market and in the late 1820s began to redevelop the site, commissioning architect Charles Fowler to design new buildings (up until then the market was housed in makeshift stalls and sheds). These include the grand main market building which still stands on the site today. The market continued to grow – there is said to have been 1,000 porters employed at the market’s peak – and in 1860 a new flower market was built on the south piazza (where the London Transport Museum now stands), while in the 1870s, a glass roof was added to the market building. A “foreign” flower market opened in what is now Jubilee Hall in 1904. In 1918, the Bedford family sold the market to the Covent Garden Estate Company. The next major installment in the market’s life came in 1974 when the market, which had outgrown the West End site, moved out to a new site in Nine Elms at Vauxhall in London’s inner south. 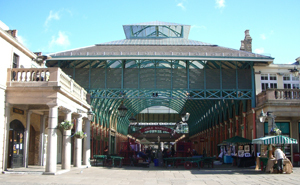 The Covent Garden site was left to fall into disrepair but, saved from demolition and redevelopment largely through the efforts of Geoffrey Rippon, then Secretary of State for the Environment, it subsequently underwent restoration, reopening as a speciality shopping centre in 1980 with areas including the Apple Market (pictured above), the East Colonnade Market and the Jubilee Market. Now owned by Capital & Counties who purchased it in 2006, the market – along with the larger 97 acre Covent Garden area – remain under the care of the Covent Garden Area Trust. Meanwhile, the New Covent Garden Market at Nine Elms is these days the largest fruit, vegetable and flower market in the UK and boasts more than 200 businesses. There are currently plans to redevelop the 57 acre market site which will include providing more space for market tenants as well as new homes, shops and community facilities like parks. WHERE: New Covent Garden Market, Nine Elms, Vauxhall (nearest Tube station is Vauxhall); WHEN: The fruit and vegetable market’s core trading hours are between midnight and 6am, Monday to Saturday, while the flower market’s core trading hours are between 2am and 8am, Monday to Saturday (times may vary for individual businesses); COST: Free (charge for cars); WEBSITE: www.newcoventgardenmarket.com. PICTURE: Apple Market Picture courtesy of www.coventgardenlondonuk.com.